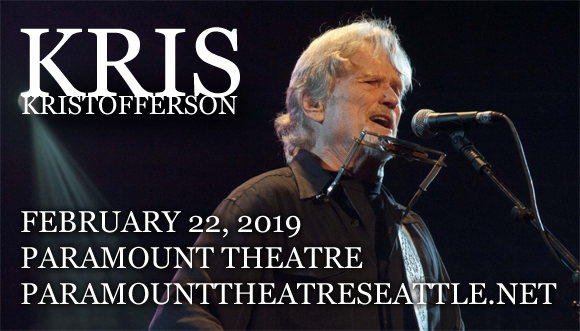 A country music renegade whose exceptional songwriting talent and outlaw sound changed the landscape of country music forever, the legendary singer Kris Kristofferson comes to Paramount Theatre Seattle on Friday 22nd February 2019! The iconic performer will be showcasing many hits from a lengthy career of heart-rending Americana that has earned him three Grammy Awards, a place in the Country Music Hall of Fame and the title of “one of the greatest songwriters of all time”! American country music singer, songwriter and actor Kris Kristofferson is best known for the hit singles "Me and Bobby McGee", "For the Good Times", "Sunday Mornin' Comin' Down", and "Help Me Make It Through the Night". Kristofferson moved to Nashville in 1965 and upon doing so, he gave a demo tape of his music to country singer June Carter, to pass on to Johnny Cash. Cash ignored the tape and, tired of waiting for a response, Kristofferson (who had a pilot's license), landed a helicopter in Cash's yard as an attempt to get the singer's attention. Although Cash was not at his home that day, the ploy worked and persuaded Cash to record a version of Kristofferson's song "Sunday Mornin' Comin' Down", which went on to win Kristofferson Songwriter of the Year at the Country Music Awards. He became known as a sought-after songwriter throughout the 1960s and '70s, scoring hits for Billy Walker, Jerry Lee Lewis, Gladys Night and the Pips, Waylon Jennings, Joe Simon, Kenny Rogers and Janis Joplin (who was dating Jennings until the time of her death and had a posthumous number one hit with "Me and Bobby McGee"), among others. 1985 saw Kristofferson teaming up with Cash and Wille Nelson to form The Highwaymen; an outlaw country group that bucked the trend of the “Nashville Sound” and inspired a country music movement. In addition to his music career, Kristofferson is a successful actor, having starred in Alice Doesn't Live Here Anymore, Heaven's Gate, Blade and A Star Is Born, which earned him a Golden Globe Award for Best Actor.